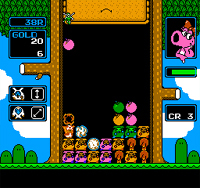 Magical Drop II is a puzzle action game released by Data East in 1996. The rules are simple. Control the clown to pull in and throw back the balloons that appear on the screen. If you line up three or more balloons of the same color in a row vertically, they will burst. Some balloons feature unique characteristics. Special balloons, which come in all four colors, pop every balloon of the same color. Arrow balloons burst everything in the direction the arrow is facing. Rainbow balloons have the same effect as special balloons, but can be thrown against a balloon of any color. And then there are bubble balloons, which simply get in your way. Together, these provide you with great chains and combos that make a puzzle game so much fun. Choose between VS CPU Mode, full of battles with a host of comical characters, and Puzzle Mode, where you'll enjoy a one-player challenge. Both modes support player-versus-player action, meaning you can have a great time together with friends.